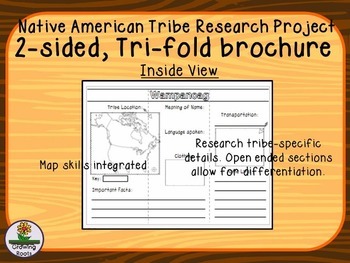 This set of 40+ Native American Tribe Research Tri-folds is ideal for independent student research. Designed as a 2-sided brochure, the end product will be focused, organized, attractive and each will be unique! 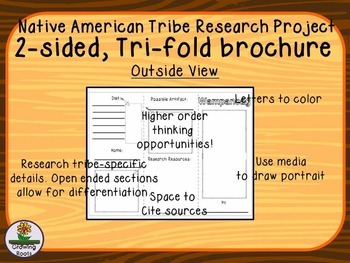 Brochures include open-ended response areas, illustration boxes, a map to label each tribe's location and space for students to cite sources – plus, there are areas promoting creativity and higher-level thinking. * 40 + Native American Tribe-specific brochures – see list below! * Kid-friendly Google Search Term card will help students do internet research more independently. 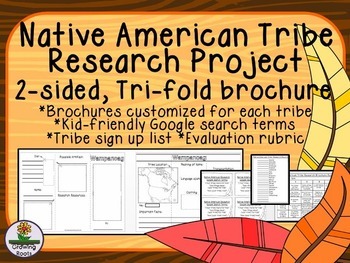 * Tribe Research List – an area for students to sign up and for you to keep track of who is reaching who! 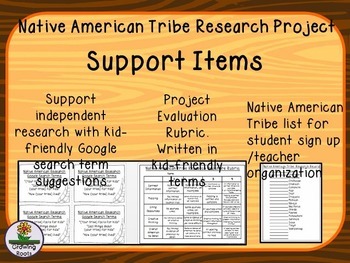 * Tribe Evaluation Rubric – allows students to see expectations and facilitates easy scoring. Students choose a Native American tribe. You print the tribe-specific brochure – and the research begins! I recognize this is not an exhaustive list. While there is a blank tri-fold so students can customize their own, I'm happy to add to this collection! Need a different tribe? Leave a note in my Q and A. I’ll add it to meet your needs. Positive feedback is so appreciated! PLEASE NOTE: I’ve significantly reduced the Additional Users License Fee to make this available for an entire grade level. When you check out, click EDIT next to the word 'Licenses' or the red button "Buy licenses to share'. Add additional licenses to cover your team. You’ll feel good about following TpT rules and be able to divide the overall cost. Pioneer Oregon Trail Enrichment BUNDLE – 4 great products bundled to save you $$$. Research Project Rubrics for Group Presentations. Research Project Rubrics for Individual Presentations. Mother’s Day Poster Set – Interactive! Create memories!.